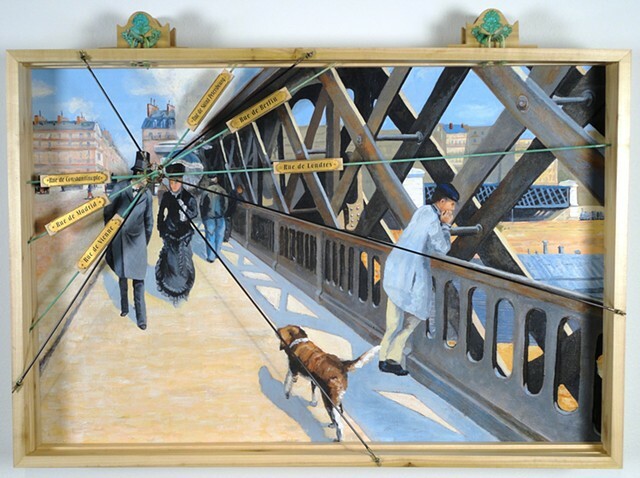 This piece is based on Gustave Caillebottes, The Bridge of Europe, 1875, depicting the area around Le Gare St. Lazare. The two removable frames mark the confluence of roadways to major European cities and the alignment of lines of perspective. Caillebotte tinkered with perspective to bring both to the single, tense point between the strolling gentleman and the prostitute.